What do Tori Spelling, Usher, Britney Spears, Randy Jackson, and Jason Mraz have in common? They all wear Energy Muse accessories. These were was featured at 'The Doctors'. Jenna Dewan, who is featured in this review's photo, is wearing an Energy Muse Power Bracelet. Energy Muse are the latest trend in accessories made from gemstones and crystals that do more than simply adorn the body. Some people might scoff and say, "Fashion accessories can heal the body?" Yet, what harm can come wearing a great necklace or bracelet do? An Energy Muse helps bring in positive energy and with constant use, does a world of good. Watch 'The Doctors' review of the Energy Muse. While doing so, keep an open mind. Take a moment to listen and then contemplate of how in history certain crystals and gemstones have been upheld for not just their beauty but the power they impart. 1. The cellular level the human body and quartz crystal are both made up of the mineral silicon dioxide. 2. We are naturally receptive to the vibrations of crystals as they transmit, reflect, store light and receive energy. 3. When gemstones are placed on the body, they have a powerful vibratory effect that surges from the stone to the individual. That is a very simple explanation - BUT there is something more to the Energy Muse than what is stated in their website. When any of the 7 chakras are out of balance, it affects our emotional, physical, and spiritual well-being. These chakras get out of balance from being overused or having been used in a negative manner. For example, a person who talks a lot in line with their profession such as a radio announcer or someone that tells a lie will have low energy in their throat chakra. Make the balance happen by using an Energy Muse. There are many popular energy bracelets nowadays. Those energy bracelets that works wonders have crushed minerals in them. 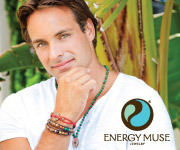 Energy Muse accessories is created from big gemstones and crystals making it more powerful than a few particles which are found in those other energy bracelets. A-Z is A-ma-Zing. Amethyst, Garnet, Hematine, Jade, Moonstone, Onyx, Pink Tourmaline, Turquoise, and many more gemstone and crystals have individual benefits. Wearing one or a combination of them brings about the desired results such as having strength, courage, bringing healing, reducing anxiety, and so much more. Harness the energy of gemstones and crystals to bring the balance needed to heal, restore, and rejuvenate the body. Learn more about the various gemstones and crystals to find one that will help balance the chakra and energize the intention with power by visiting the Energy Muse website. Have you used the Energy Muse? Share your review!